On the morning of September 27, 1864, the usually quiet central Missouri town of Centralia was sent into chaos with the arrival of a company of about 80 Confederate guerrillas under the command of William T. “Bloody Bill” Anderson. Calling Centralia “a pretty place for a fight,” Anderson led his men, who included Frank and Jesse James, as they raided homes and shops, robbing citizens of money and possessions, including carrying whiskey away in boots stolen from a merchant. The scene, as described by the citizens who witnessed it, and by the passengers and the guerrillas, was terrible and horrible. The guerrillas were shouting and cursing; brandishing pistols and threatening everybody; the women and children were crying sobbing and mourning. “Bloody Bill” ordered the soldiers off the train and formed in line on the south side of the railroad. An elderly man was herded off the train along the 23 soldiers because he was wearing a blue blouse and soldier’s cap. One Union soldier, Sgt. Thomas M. Goodman, was pulled from the line and held captive for possible exchange for a member of the guerrilla band who was being held prisoner by the Federals. Upon Anderson’s order to “parole” the soldiers, his men opened fire upon the line of men in blue. Some fell upon the first volley, while others struggled to escape before finally succumbing to the revolver shots. The guerrillas then set fire to the train, sent it back on its way westward, and then departed the horrified town to join a larger contingent of Confederate irregulars at an encampment along Young’s Creek south of town. Around 3:00 that afternoon Maj. A.V.E. 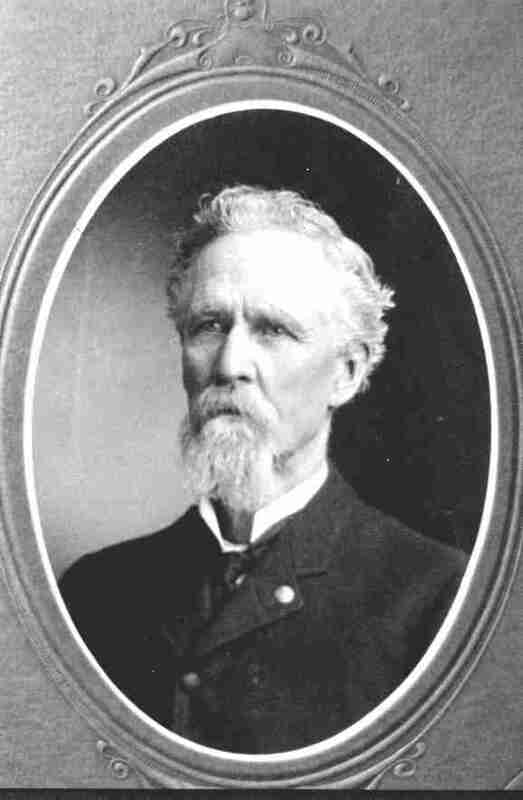 Johnston arrived in Centralia with 150 federal soldiers from the 39th Missouri Infantry. Hearing of the atrocities committed by Anderson and his men, Johnston declared his intention to pursue and punish the Confederates. Despite being warned by the terrorized citizens of Centralia, Johnston and about 120 of his men departed Centralia. It was the wildest and the most merciless, and in proportion to the number of force vanquished, the most destructive of human life. Out of a total force of only about ninety, which was in line of battle, and thirty solders detailed to hold horses in the rear, one hundred and eight fell before the remorseless revolvers of [guerrilla leader George] Todd’s and Anderson’s men–men who, fresh from the horrible scenes of blood and pillage and fire at Centralia that morning, were prepared for other scenes of carnage on a larger scale in the afternoon. 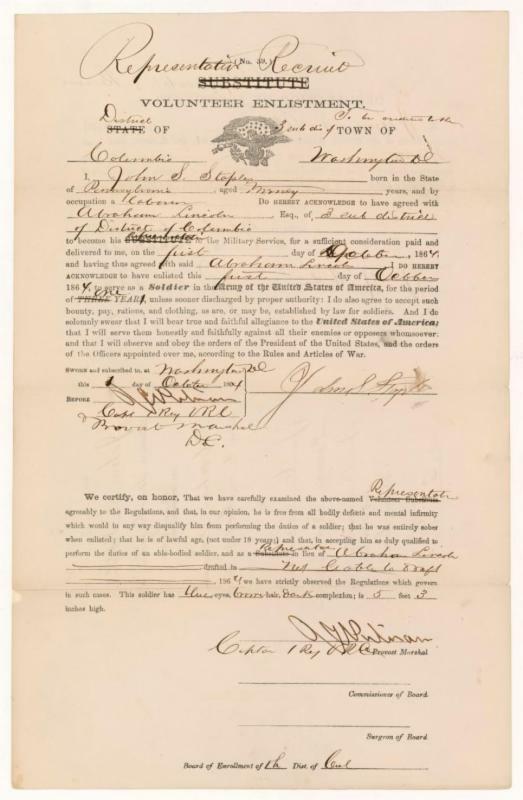 The substitute papers signed by President Lincoln and Staples. Click on image to see larger. September 17, 1864. Too old to be drafted and, as president, exempt from the draft, Lincoln nonetheless voluntarily hired a substitute. The president had encouraged others to do so, and so he did so himself. 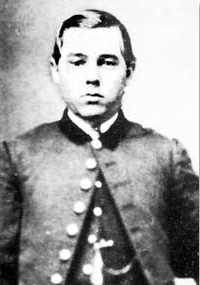 On October 1, 1864, Lincoln paid a “representative recruit” to fight for him — nineteen-year-old Pennsylvanian J. Summerfield Staples. A laborer, Staples had served as another man’s substitute earlier in the war. He came to be Lincoln’s substitute by chance: he was walking down Pennsylvania Avenue and bumped into Noble D. Larner, . . . the man whom Lincoln had asked to find an appropriate recruit. When Staples expressed interest in the job, Larner took him to the White House. There, Lincoln approved of Larner’s choice, and paid him $500. Staples served in the Army for a year as a clerk and a guard. He died of a heart attack in 1888 at the age of 43. “The Man Who Fought in Lincoln’s Name,” Rebecca Onion, The Vault, Slate. “. . .You wanted to know what I thought of [the Democratic Presidential candidate General George] McClellan. I like him well enough, but the party that nominated him and the platform that he stands on I despise and we can’t expect any more of him than the men who nominated him and support him. Do you suppose you can make a soldier believe that an armistice would be right. The sneaks would give the Rebs all we have gained in the last three years. If the Union was worthy saving in the first place it is worth it now. I would ask Pa or any other man that pretends to know anything what Lincoln has done that any Union man that loves his country can find fault with. Let them look at his past life and see if he could have done better in any instance, then why not support him. I intend to say that any man that votes against him and for McClellan votes against his country and right and favors the Rebels and treason. The good book says the sin of ignorance is to be winked at. We should look at the way some vote in the same way. There are a great many men that know no better. Some are as foolish as to think if we can defeat Lincoln the war will end right away. But I think the election of Lincoln will do more toward ending the war than any victory of our armies since the war began. I hope no one that has sons or brothers in the army will do them so great an injustice as to vote for McClellan with the expectation of shortening their term of service in the army . . .. If you would burn that Copperhead Patriot [the main Democratic Party newspaper in Madison, Wisconsin, and one of the most important in the state] up and take a paper that pretend to tell the truth, you would think different from what you do. . . . I think we have but one man in our Co that will vote for McC. And he is an ignorant Irishman. Do you think you will understand by what I have written what I think? . . . The soldiers’ vote will prove very important to the outcome of the 1864 presidential election. Robert E. Bonner, The Soldier’s Pen, p. 144.